So it’s not like I light a candle or get a tear in my eye, but I do always smile when I write the date on November 4th because the dork in my brain will always remember that as the first time I saw Pearl Jam live in concert. 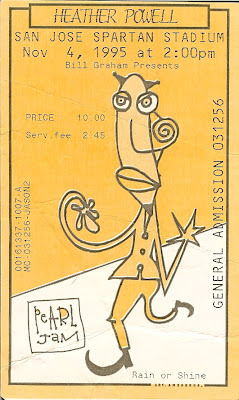 Nov 4th 1995 was the rescheduled make-up Bay Area date for the aborted Golden Gate Park show five months earlier where Vedder bailed after seven songs due to food poisoning and the remaining members played a scorching set with Neil Young, dubbed “Neil Jam.” As you can see above, this was their alternate ticketing tour using non-Ticketmaster venues. This translated into really cool [Ames Bros] ticket art. It was my junior year of high school and I had been waiting for almost two years to see Pearl Jam live. 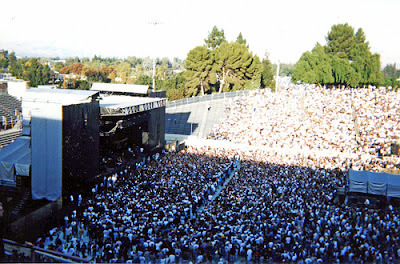 The show was held at San Jose State’s Spartan Stadium, an outdoor amphitheater. I remember joining the front end of a snaking line around the venue with my friends early in the day for the 2pm show, after purchasing a Mr. Point t-shirt (that I still wear on rare occasion). In the late morning, the garbled but powerful melody of a soundcheck chorus and thundering drums rose through the autumn air. Hence I’ll always remember that the first song I ever heard Pearl Jam do live was “I Got Id” during the soundcheck. As for the show itself, I hung on for as long as I could in the roiling masses of circa-1995 PJ fans — as it turned out, my capacity was about six songs. Once “Not For You” kicked in, I thought I was going to die and had to get pulled out in favor of a spot a bit further back. from the opening tambourine shakes and the near-mystic melody, this was the perfect final song in an exhilarating concert. My first of many PJ-induced exhausted/euphoric-bliss moments. When everyone chorused “I’ll swallow poison until I grow immune, I will scream my lungs out ’til it fills this room. . .” I was right there in the thick of that. As I walked out, I remember feeling urgently within my 16-year-old self that everything was going to be okay if that kind of connection existed in the world. 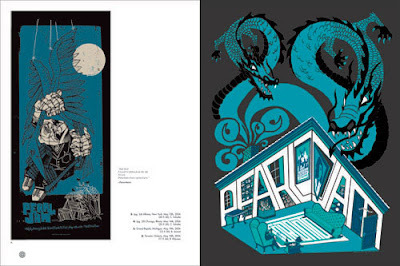 A new hardcover book was announced last week on the fantastic topic of Pearl Jam artwork: Pearl Jam vs. Ames Bros. PJ’s been blessed as a band to have longstanding partnerships with artists Ames Brothers (Jeff’s brother Barry Ament, and Coby Schultz — they actually designed the Mr. Point shirt & ticket stub above) and since 1999 with Denver-bred artist Brad Klausen. Collectively these guys have produced some of the most unique and energetic original posters of any other band I know. 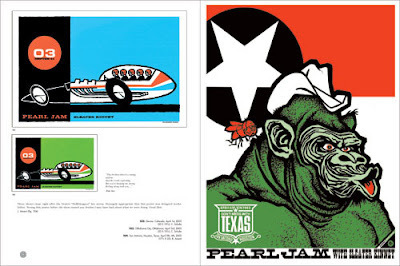 The new book is 264 pages, and features commentary on individual posters from all five members of Pearl Jam and from the poster designers — offering insight into the inspiration, concepts and process of poster creation. There was a little excerpt of the new book in the most recent PJ magazine Deep, and it was fascinating even to me (a very-very-non-artist) to see the way that the poster concept develops and emerges, and reflects something of the music and the mood of the city. Your coffee table will be 86% cooler. Tagged with concerts, pearl jam. Great Story. My first show was also that ’95 non-ticketmaster tour. It has my Mom’s name on the ticket since it was her Credit Card that was used in purchasing. I remember hearing busy singals for almost 2 hours before getting through for those tix. The show I went to was the legendary Soldier Field Show, I think on July 10, and the pit was insane there too. They were moshing and body surfing during blues legend Otis Rush who started off the show! This is a great site. I wasn’t sure on getting the posters book but now I think I just might. Thanks for all of the new mp3 samples of everything here. Heather, where do you obtain a copy of the PJ magazine Deep? I haven’t seen it in stores and don’t see it anywhere on the PJ site. Please help! russ – Sorry, I should have specified, it’s the Ten Club fanclub newsletter dealie, so you join the fanclub and you get I think 2 or three issues a year. The most recent one also has a fantastic interview with Josh Homme (conducted by Stone Gossard) and a recipe for tunapasta, which I am SO trying. Thanks for this post. I have a similar story of course with them canceling and rescheduling at South Park Meadows in Austin. I’ll always remember September 16th, 1995 for the same reasons. Being able to see R.E.M./Radiohead the night before in Houston; that weekend (at 15 years of age) made me the music fan I am today. P.S. – I’ve still got that t-shirt. Heather, great story. As said by an anonymous in a previous comment I just posted on PJ with a picture of a customized Playmobil which I used to train to crowd surf … I didn’t have facial hair back then … funny ! Heather I was there too and I still have the CD that the NEW 98.5 KOME gave away. I was once the tenth caller after a Pearl Jam song, to win it. kappa, oooh I just remembered that I’m pretty sure you can see me on the cover of that cd, I lost mine. Can you scan your cover and email it to me? It was a shot of the crowd, if I remember correctly. thanks for the flashback. Good story. However, now I must ask, what are the chances the rest of this show might be posted… say for some other Pearl Jam-related special occasion? Thanks for sharing that, Heather. I remember the first time I saw PJ like it was yesterday. It’s always nice to hear a fellow fan’s story. Your blog is the best. Thanks for all your hard work. That show was swesome! I flew out from Milwaukee to visit a buddy of mine. I remember recording the show and thinking how awesome it would be to find a good quality of the show…and then I did. It was the debut of Red Mosquito, Brain Of J, Leaving Here, Lukin, I Got I.D. and Dead Man (before Ben Harper’s performance)…plus remember “Working at Taco Bell”? Amazing show. I saw them for the first time on September 6, 1993 at the Portland Meadows Race Track. I saved up the money to go from my paper route (seriously) and my dad agreed to drive me and my friend Keri down there (3 hours from Seattle) since I had received good grades on a recent report card (a deal is a deal!). It was just a few days after the VMA’s (where they played “Animal”) and they were touring with Neil Young in support of “Vs.” and Blind Melon was the opening act (not a bad bill, eh?). I was a sophomore in high school, rather than a junior, but the rest of what you’ve written here is pretty close to what I experienced too. I lasted about three minutes in the pit, but managed to lose my dad enough to really enjoy the concert (“Why do they dress like that?” “Do you actually like these songs?”). Cliche as it might be to say, it felt like an amazing time to be alive. Ah… this post not only brought back good PJ memories, but memories of good music in general that was new to me then. Thanks! memories of the 95 tour..i saw it in las cruses new mexico. A friend sent my sister a tape of pearl jam live from kroq (los angeles radio) from a show they did in atlanta. made me more pumped since they postponed the first show. 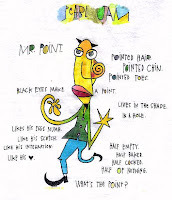 my first band I was loyal too, my first concert..it was great..got the mr point drawing tattooed on my arm..to always remember. saw the 2000 tour in nashville..bootleg cd helps me relive it.